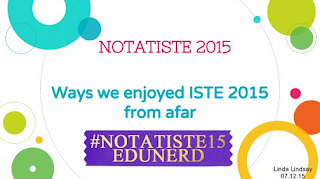 'Twas FUN to be a guest on EdTech Mixed Plate's ISTE 2015 Edition! I learned a lot! Be sure to take a look at the Show Notes, with everything mentioned in the show and more, here. I represented the #NOTATISTE15 crowd and did a Google slide presentation (overkill, I know, but I wanted to make sure I put everything in there -- I tend to ramble). The #NOTATISTE Google slide presentation I used on the show (view, starting at 24:44) is here, and I uploaded a slightly different version to Slideshare.net to take into account that clickable links aren't allowed on the first three slides of Slideshare. Feel free to share it far and wide! Who knows what the future will bring? If I'm not able to attend ISTE next year, I'll definitely be participating in #NOTATISTE16! Mahalo to +Michael Fricano II, +Michelle Carlson Colte, +Peggy George, and +Shane Asselstine for a very informative show, and to +Jennifer Wagner for building a terrific #NOTATISTE G+ community!